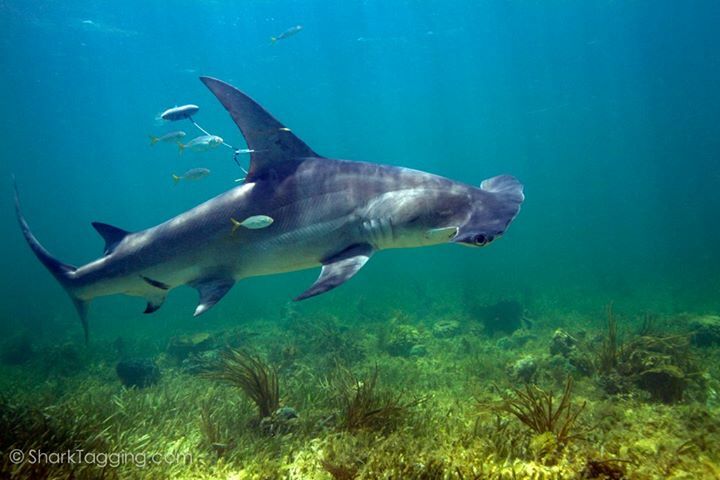 Want to name a shark and track it with Google Earth? Donate to my SciFund project! Thanks to the 73 people who have donated to my SciFund Challenge shark feeding ecology project so far, helping me to meet and surpass my minimum funding goal! I can still accept additional funds beyond my minimum funding goal, and all funds raised will still be used exclusively for lab processing fees. As before, donations of any amount are appreciated, but larger donations have rewards. One of the rewards for donating to my project is the opportunity to “adopt a shark,” supporting our lab’s ongoing shark satellite tag tracking research. Specifically, the reward for a donation at the $3,000 level is that you get to name one of our lab’s GPS satellite tagged sharks, which can be tracked using Google Earth for up to 2 years. You can also give this reward as a gift, letting a shark lover in your life name the shark. Our tagged sharks, which include bull sharks, tiger sharks, and great and scalloped hammerheads have made amazing migrations sometimes exceeding 1,000 miles! 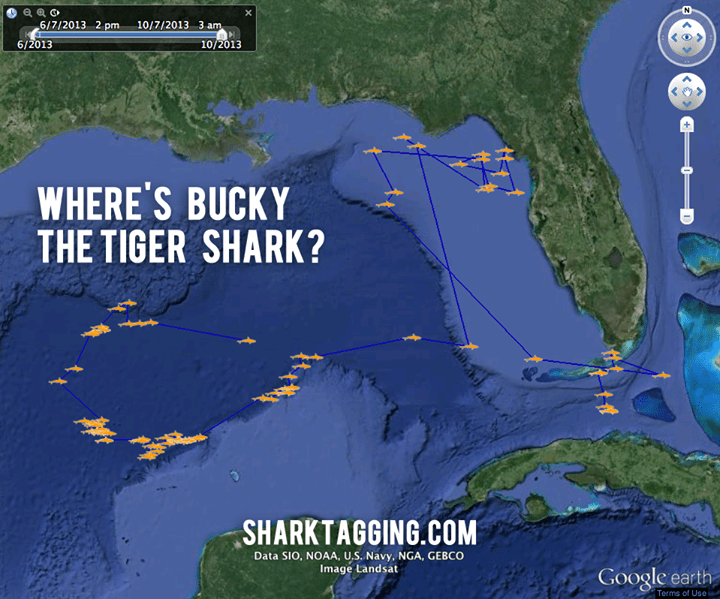 The movements of Bucky Badger the tiger shark, named by a U Wisconsin alumnus. In addition to the opportunity to name one of our satellite tagged sharks, a donation at the $3,000 level includes all of the other rewards offered by my project, including the opportunity to join us in the field for a day of shark research. You can learn more about the satellite tagging project here. You can learn about the steps we take to make our non-lethal research methods as stress free as possible to the sharks here. 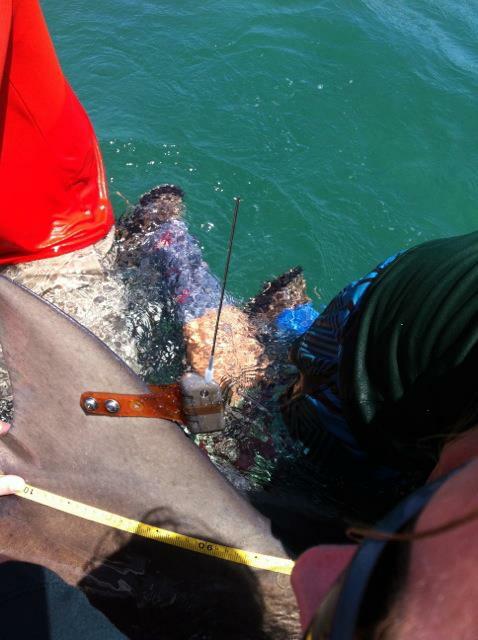 You can read the answers to some frequently asked questions about satellite tagging of sharks here. You can learn more about my project and make a donation here. Thanks for your continued support! Help support marine biology SciFund projects! 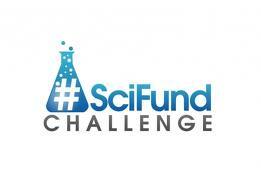 Thanks for your support of my SciFund crowdfunded shark research! Want to participate in a day of shark field research? Donate to my SciFund project!